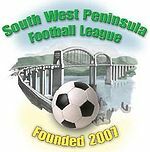 The South West Peninsula League is a feeder to the Western League Premier Division, with its Premier Division at Step 6 of the National League system. One of the newer leagues in the country, it was formed in 2007 as a merger of the South Western League and the Devon County League, catering for Step 6 and Step 7 football in the counties of Cornwall and Devon. The league consists of three divisions - a Premier Division, Division One East and Division One West. Division One West consists mainly of teams from Cornwall, while Division One East is mostly based in Devon, but the dividing line between the two does not always follow the county boundary, rather the line is adjusted to take into account the clubs at the Division One level. Current members with previous Western League experience include Crediton United, Elmore, Falmouth Town, Liskeard Athletic and Saltash United. In its limited lifespan, Buckland Atheltic are the only club to have taken up promotion from the Peninsula League to the Western League. Truro City became the first club to have a reserve side in the Peninsula League in 2008. No Peninsula League sides as yet have made it past the Qualifying Rounds of the F.A. Cup, (best performance has been by Bodmin Town in 2011-12 when they made the Third Round Qualifying) but Torpoint Athletic set a new F.A. Vase record for the league in 2010-11 by reaching the Quarter Finals.